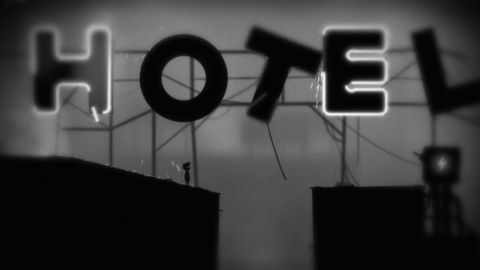 Limbo is a beautifully designed masterpiece of a platform game, that will chill, challenge and charm in equal measure. You are a boy searching for his missing sister. You wander through gloomy forests, explore forbidding caves and try to escape a industrial complex of whirring machines and smoke stacks – all painted in silhouette against the smoky greys of an old flickering film. It's amazing that such a simple approach can create such a nightmarish atmosphere. 'Simple' is an excellent word to sum up this indie platform game. From its monochrome presentation to its single sentence storyline, it creates a spare, deadly, lonely world, devoid of colour and distraction. You brave yawning landscapes with nothing but the rustling of your feet to keep you company. Large sections of the game are silent but for the occasional drip of water, or a cavernous echo, sometimes punctuated by fractured, urgent music, or footsteps racing into the distance. The only humans you come up against are hostile, chasing you away with spears and darts. Everything in Limbo is out to harm you. From the moment the scenery come to life when that first giant spider-leg unfurls, a hundred times more menacing than it has any right to be, you're in world that doesn't want you there. It's a meat grinder, coldly snapping beartraps around your fragile little frame, crumbling the boy into a pile of body parts. It stresses you into making mistakes: you know exactly what horrible thing is about to happen to your little ward when presented with a pressure plate and a crushing device. Limbo's obstructions are grossly imaginative, requiring morbid solutions: one puzzle's resolution comes when you drag a corpse into a pool so you can use it as a bloated, floppy stepping stone to the other side. When not being chased by implacable spiders with a penchant for skewering bodies, you'll be feverishly searching for floating crates to ride as water rises above your ankles, or plucking the remaining leg off a maimed spider and rolling its body to block spikes and clamber to a ledge. Limbo's initial morbid world of beartraps, corpses and ravenous arachnids eventually leads you into industrial levels, full of more conventional puzzles, such as gravity switches, elevators and even machinegun turrets. It's around this mark that the puzzles become far more frustrating, requiring precision timing to progress. You'll occasionally be reduced to a weeping mess of tears and tantrums, defeated by a straightforward but deadly puzzle that can only be overcome by getting everything just so. I spent a lip-gnashing, keyboard smashing 20 minutes trying to run across a length of railway track before a descending minecart hit a switch to electrify the rails. Twenty damn minutes watching my boy judder as his tiny legs failed to make the last jump. Your most horrific foes are the brain slugs, which drop from above and burrow into your skull. Once nestled in your cranium, they force you to stagger in one direction – normally straight into a pit of spikes. Make no mistake: you're going to die. A lot. It's impossible to pass five minutes without succumbing to Limbo's sick snags. But finally realising the infuriatingly simple solutions and achieving that bloody jump will reward you with Portalsized feelings of smugness and relief.